How Much is that California Doggie? Pretty darn cheap at The Hotdogger in downtown Davis, California. 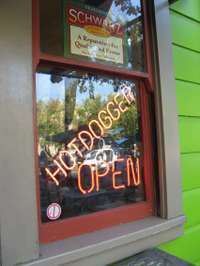 For more than 30 years, Hotdogger has walked many a joyful diner down ‘the dog’ path. This wiener-sized café provides limited counter-seating. The dogs, on the other hand, are not your tea-cup variety. These California dogs may not be AKC line-up, but they are pure-bred delicious! Your classic all-beef Chicago Dog with German mustard, tomatoes, diced onion and relish will set you back $5. From across the border, the spicy Ortega Dog with green chilies and pepper jack cheese will light your fire for $5.75. The Gut Bomb ($6.50), The Bandito ($5.50)...Louisiana hot links, chili, salsa, onion…where’s the Tums and Scope? Of course they also serve the PC Veggie Dog breed ($4.75). Well-groomed with mustard, ketchup, relish, onion and a sprouted wheat bun, it’s just like the real thing. Well, maybe. The second owners, the Franks – no, I’m not kidding – have been Davis’ tube steak mavens since 1993.